Kotick says he sees opportunity in every platform and doesn't mind shelling out a little to widen Activision's net. According to Activision CEO, Bobby Kotick, the publisher does not play favorites when it comes to platforms, and remains neutral at all times. What's more, he added that anything that could run Activision-made content was potentially of interest to the publisher. Speaking during a conference call that accompanied the recent earnings report, Kotick said that as long as a device had a processor and a display, and was capable of delivering an experience that Activision's audience would enjoy, then the publisher was willing to invest in it. He was also seemingly unconcerned about the costs involved in getting Activision games on new platforms, saying the likes of Nintendo and Microsoft invested billions of dollars into producing hardware that made Activision games possible, and that they deserved to be compensated for it. While Kotick's comments make a nice change from the usual quotes that are attributed to him, he's likely to take some heat from gamers for saying that Activision doesn't favor one platform over another. Despite Kotick's comments that Activision would put a game on anything that could run it, the publisher has been criticized recently for ignoring social and casual gaming. 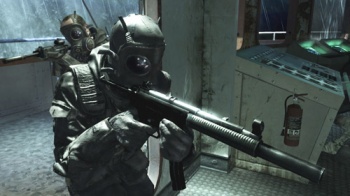 Additionally, the complaints about the PS3 and PC versions of Call of Duty: Black Ops stemmed from the belief that Treyarch and Activision had devoted the majority of the resources to the Xbox 360 version of the game, as thus delivered a lesser experience on other platforms. Whether these accusations of favoritism towards the Xbox 360 are true or not, the perception that they're true isn't really diminished by the timed exclusivity deal that Activision has with Microsoft for Black Ops DLC.